make you want to curl up like a cat and soak in the rays and the view." "Warm, sandy beaches. The vibrant blue of the ocean. A hammock rocking in a salty breeze. These are just some of the subjects that watercolor artist Jinx Morgan lives—and paints—for. as well as their bright floral colors and shady palm trees." Jinx Morgan's watercolor paintings reflect the fresh colors and brilliant light of her home in the Caribbean. Born in California, Jinx now makes her home on the island of Tortola in the British Virgin Islands. Inspired by the strong sun and shadow patterns of the tropics as well as the charming villages and spectacular scenery of her island home, her paintings depict the easygoing life of the Caribbean. She has studied with David Millard, Judi Betts, James Godwin Scott, Jeanne Dobie and Carolyn Lord. Four of her paintings were chosen to hang on the walls of the Legislative Council of the British Virgin Islands and one of her paintings is on display at Government House. 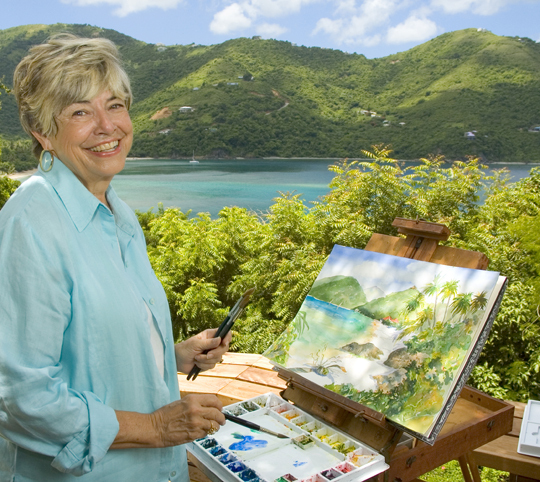 During a recent visit to the BVI, the Duke of Gloucester purchased one of her paintings. In 2006 15 of her watercolors were included in a show in London at BVI House and in 2015 she had a one woman show of her work at the Old Sugar Works Museum in Tortola. Her works are also in private collections in the United States, Canada, England, Italy and Austria as well as in the Caribbean. On Tortola her paintings and prints are on view at Images in Road Town and Hucksters on Main Street. In St. Thomas her work is available at Mango Tango Gallery. Jinx and her husband Jeff are the former owners of The Sugar Mill Hotel on Tortola and were for many years Contributing Editors and columnists for Bon Appetit magazine where their articles on food and travel appeared regularly. If you are interested in purchasing a painting or a print please send an e-mail to jinx@watercolorsbyjinx.com or jinxmorgan@mac.com with the description of your selection and arrangements can be made for for payment and delivery. For further information click here to go to Contact and Purchasing Information.